Not only was this 30 years prior to the global warming hysteria, but at that time, scientists were asserting that the climate was cooling. 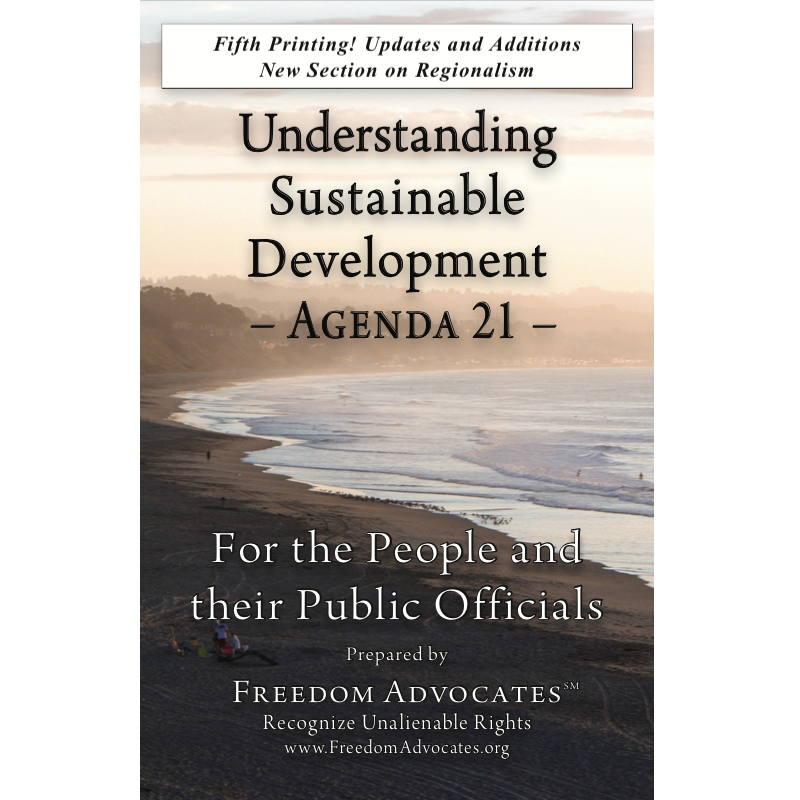 Also recall that Agenda 21, which calls for what Al Gore has since termed a “wrenching transformation” of America, was unveiled in 1992, and incorporated into American governmental machinery in 1993, via Clinton’s President’s Council on Sustainability. This radical agenda was adopted in America a full 13 years before the UN’s IPCC released its famous (or infamous, depending on one’s perspective) study claiming to prove the existence of catastrophic manmade global warming. In other words, the “Sustainability” agenda, which calls for governmental and, by extension, international control of land, natural resources, food, water, energy, cars, housing and more, in America, was drawn up many years before global warming hit the decks as a rationale for the program. The cart came before the horse. And now we are asked to believe that the already debunked and always highly controversial hypothesis of catastrophic anthropogenic global warming is reason enough for us to sacrifice our homes, our lands, our property, our rights, our way of life, and our country. Notice too that “global warming” morphed into “climate change”, presumably because people were noticing the world was not getting hotter. And then, since the “climate” i.e. weather, is always changing, the buzzword morphed again, into “climate reality,” presumably because one cannot argue against “reality.” The hysteria increased with the emotionally charged term “climate deniers,” conjuring up the moral perfidy of holocaust deniers, and ratcheting up the whole bogus theory to the level of religious dogma which relies on faith. All of this, of course, is the opposite of hard science. Perhaps that’s why 20,000+ legitimate, non-UN-sponsored scientists have not only debunked the flawed theory that was based on flawed computer modeling, but have also expressed outrage at this parody of science. In short, the “Sustainability” plan is about power and control, not about the weather. It is a plan by and for the elitist 1% who seek to dominate and exploit the 99% in an unprecedented global power play masquerading as humanitarian environmentalism. It would bring about the greatest transfer of wealth in human history, from us to them. Who are some of these great environmentalists? Are they living in modest hovels and riding their bicycles to keep their “carbon footprints” down? Or living in crowded Smart Growth stack-and-pack condos along rail corridors? I doubt if this profile, prescribed for the 99%, will be followed by the chieftains of Sustainability: billionaires Maurice Strong, Al Gore, Mikhail Gorbachev, and George Soros, among others. In fact, Al Gore, Obama, a host of Goldman Sachs heavy hitters, and George Soros (through connections with the Joyce Foundation), have already lined up to profit off the 99 percenters’ misery, by creating the Chicago Climate Exchange with which to make a predicted $10 trillion a year from our planned crippling carbon taxes. But wouldn’t this system cause energy rates to go down? Then-Presidential Candidate Barack Obama stated: “Under my plan of a cap-and-trade system, electricity rates would necessarily skyrocket.” Ah yes, to discourage the 99% from using heat, air-conditioning, stoves, or lightbulbs. And to provide great profits for…take a guess. The elite multinational powerbrokers, financiers and billionaires who run our country behind the scenes, want to switch from the war machine they’ve used to fatten their coffers all these years, to a ‘peace economy’; while this sounds good at first, they long since made plans to substitute a created global catastrophe for war, so they can continue to exploit and control the masses. They’ve said as much in several of their publications, including the Club of Rome’s The First Global Revolution. Whether you follow the money or follow the science, it becomes all too clear that the 1% is out to own the world and everyone and everything in it. This is the New World Order, and this is why we need to fight every aspect of Agenda 21/Sustainable Development, including: Smart Growth, the Grand Boulevard Initiative, Climate Action Plans, Carbon Taxes, Cap-and-Trade, California’s onerous pieces of legislation AB 32 and SB 375 etc.—to remain a free people in a free Republic. Cherie Zaslawsky, MA, is a writer, editor, and educator. She is committed to the fight against Agenda 21 and to educating the public regarding the real and present dangers it represents. She also writes on other related topics.